William Hill is a British bookmaker. It’s extremely reputable. Let’s see, we usually say that the casino which was created in 1990s is a reputable casino – and this bookmaker began its work in 1934! Its 83 years history is a very good sign, and we are pleased to write this William Hill review. This bookmaker is licensed by the United Kingdom Gambling Commission, and it’s one of the best variants possible. The United Kingdom Gambling Act allows the companies to provide the services to the people not from the UK only, but from the other countries as well. The only limitation is: you must be over 18 years old. Another license of William Hill is provided by the Gibraltar Government, and it’s a trusted regulator, too. All in all, these two licenses mean that you are protected by the laws of the two countries, and your regulations with this bookmaker are regulated by the authorities. Unlike some other licenses, these two mean that your problems will be solved even if you can’t solve it with the bookmaker directly. Of course, the William Hill’s website is created with the SSL encryption – that’s exactly the technology the banks use, so please, don’t worry – your personal information is protected, as well as your financial data. When we talk about the bookmakers, we talk about “markets” not about the slot machines or something like this. The number of markets is usually less than the number of games in an average online casino – thus, if we can see 200-500 games in casinos, there are just 33 markets in William Hill. And it’s even more than enough. You can bet on almost all the existing sports here, from hurling to soccer and football. The leagues of Europe and the USA are available. There are casino games (slot games, bingo, poker and video poker) here, and what is more, you can even play live games with real dealers. It’s a good assortment for a casino, and for a bookmaker such a wide choice is even more than good! Another interesting experience is live streaming service – you create an account and watch the HD streams of the most popular games for free. And here comes the trouble. It’s the only casino from our list without a live chat support – that’s not what you expect to see at one of the best bookmakers in the world. This is a con, and that’s a bad result. We hope they will do something with it – a good casino and bookmaker can’t be called good if it doesn’t have a round the clock live chat. However, the support team is good here (if we would forget about the live chat). Lots of clients say that the support agents are helpful and friendly, they answer fast (via email, of course), and we can’t say anything bad here. Everything is fine with the withdrawals, except the pending time. Sometimes you’ll have to wait for 4 business days to get your money, and its not a good result, again. However, the payment itself is proceeded quickly, the problem is the pending period, nothing else. If it’s your first withdrawal, be ready – you may have to wait for a quite long time. And send them the scans of your documents (like ID, passport, etc.) – it may help and speed up the verification process. 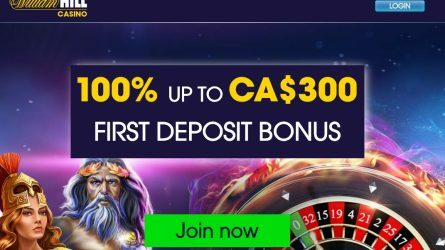 You get 100% of your first deposit (no more than $300), and it’s a very good opening (or welcome) bonus. There are also different bonuses that are available during the major sports events. William Hill is known for its interesting bonuses and bonus offers, so we recommend to try. However, they often terminate their old bonuses and offer the new ones, so it makes no sense to describe all of them. Try and see! The good news about the restrictions is: you can play and place your bets here if you are from the United Kingdom, Germany, Canada, Russia, Australia and some other countries. The bad news is: the restricted list is very long – there are more than 60 (sixty!) countries in this list. Please, check if your country isn’t in this list – in such case you could use a VPN or proxy, but it’s not recommended to do it. Well, it’s up to you – the William Hill bookmaker is definitely worth your time and money.